(RRP £599.99). 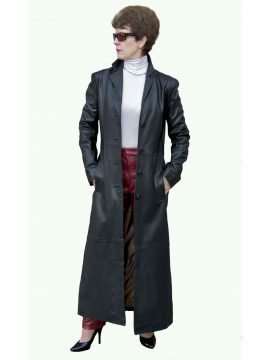 A very high class ladies maxi leather coat in superior quality soft lambskin, superbly tailored for a figure-hugging fit. It is single breasted with front button fastening and has a long back vent. It also has stitching detail at the front edges, collar and pockets. It is fully lined with a high quality amber-coloured material with piping detail, embossed with manufacturer's name. By Ashwood. *** Please Note: Your coat bust size WILL NOT be the same as your bra size – therefore, please measure (with a good tape measure) around the fullest part of the chest. *** Please see our Product Description below for full details and important sizing information.